The top-of-the-line Roku XD|S digital video player promises instant access to the highest quality Internet streaming content you can get up to 1080p along with local media playback via USB and a plethora of inputs and outputs to fit into almost any audio-video configuration all while being simple to use, small, power-efficient and priced just under $100. This sounds like quite a tempting offer whether you’re looking to cut the cord or supplement traditional broadcast and physical media consumption. 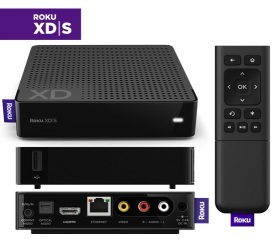 While you can scope out how the Roku XD|S stands up to competing products in our Media Player Comparison Guide, continue reading for a detailed look at the XD|S and whether Roku’s offer can possibly be refused. The Roku XD|S arrives in an efficient package, most of which can be recycled. In addition to the XD|S, Roku provides an external AC power adapter, an infrared remote control with two AAA batteries, an analog audio/composite video cable, a getting started guide and a warranty card. The XD|S’s compact size and form factor gives a lot of flexibility in placement. There are two rubber strips that keep the unit from sliding around. The unit is adequately constructed out of plastic and passively cooled with plenty of ventilation holes on the top of the chassis. When the unit is powered on, a soft, filtered blue light-emitting diode (LED) is lit. The infrared remote is also constructed of a reasonably adequate gauge plastic and rubber buttons. Pressing one of the remote’s buttons has a reassuring feel and slight click to it. The XD|S acknowledges a remote command by momentarily toggling the chassis LED and producing an audible indication of a button press. The infrared signal seemed strong as commands were received even when pointing the remote at fairly extreme angles. The buttons do appear to have their function printed on them and I fear that over time, it could wear off with heavy use. Notice that the remote has a purple fabric “Roku” tag that is also present on the XD|S chassis. I found this tag to be a bit annoying because it is relatively stiff and the corners tend to stab my palm at times which is not a pleasant feeling. I decided to first connect the Roku XD|S to my display via HDMI and to my network via 2.4GHz 802.11n which is protected with WPA2-AES. After the XD|S finished its power-on sequence which takes over 180 seconds, I started the guided setup. As you can see, the XD|S saw my protected wireless network, however, the XD|S refused to authenticate with my wireless access point. I plugged in an Ethernet cable to my gigabit wired network and finished the guided setup. At this point, I decided to walk through the settings menu and check for any firmware updates. Sure enough, one was available. After applying the update, I once again tried connecting via wireless and this time, the XD|S successfully authenticated with my access point. For a device that is promoted as being “really easy” and quick to setup, this is an unfortunate bug. Hopefully, Roku will update its shipping firmware in a timely fashion. One additional step of the setup is that you must go to the Roku web site to create an account and link the Roku device to your account. The Roku XD|S user interface uses a concept called channels to represent branded content experiences. The channels are presented in a single row on the home screen. Using the left, right and OK buttons, the channels can be browsed on the home screen. With a lot of channels, navigation can be tedious and makes me wish that a two or three-row option was available. While channels can be easily added from the user interface, they can also be added from the “channel store” on the Roku website. Some channels are apparently in some sort of beta or testing stage as they are “private” channels and must be added manually through the Roku website using codes found in the Roku user forums or other websites. Premium channels requiring payment such as Netflix or other account-based services such as Pandora provide an alphanumeric linking code and URL where the code must be entered to establish a link between the XD|S and the content provider’s site. Channel positions on the home screen can be changed by pressing the option (star) button. The same button also allows you to remove or rate a channel. The remote’s directional, OK, back and home buttons allow for easy and intuitive navigation of each channel and the home screen. Depending on the channel, there are sometimes inconsistencies with how the back button is handled. Sometimes the up arrow is required instead of a more intuitive back command. Once content begins playing, the play/pause, fast-forward (FF), rewind (RW) and instant replay buttons become useful. The instant replay button allows skipping back about 10 seconds in the program without re-buffering the content which is caused when using the FF/RW controls. Speaking of buffering content, the amount of time buffering can be quite long. At times, I measured up to 40 seconds or more spent buffering content via a wired 12+ mbps cable Internet connection. The good news is that once content finished buffering and started playing, I never experienced a drop out or re-buffer during my use. When comparing the XD|S Netflix application to my Samsung display’s implementation, the XD|S always seems to take at least 5 seconds longer to buffer. My comparison was hardly scientific, but switching back and forth between devices seemed to yield the 5 second or more difference each time. Video quality is only slightly below that which I can achieve by using my display’s native Netflix interface. This is not going to be discernable by most people and I attribute it to the display’s ability to process the video natively. If you’ve used the Windows Media Center interface, the video quality of the XD|S is vastly superior. Audio is stereo only. I watched an entire SD movie and saw one instance of tearing and two instances of macroblocking. This may have been due to a connection issue. Audio is stereo only. Unfortunately, the XD|S appears to only be capable of standard definition (SD) playback of Hulu Plus streams even though my display’s native Hulu Plus application can play the same streams in high definition (HD). Buffering of streams seemed quicker than using many of the other available channels. Audio is stereo only. Quality is highly dependent on the provider. Some channels such as Revision3 offer reasonably watchable 720p while others could be unwatchable or on the verge of unwatchable. There was some content that I saw that was postage-stamped (pillarboxed and letterboxed) with no way to zoom in on the image from the Roku XD|S interface. Roku proudly promotes that the XD|S is capable of 1080p playback. When using the HDMI output with my 1080p display, the output is 720p at 59.94 frames per second (fps). I was able to find some 1080p content via the YouTube “private” channel which caused the XD|S to display at 1080p at 29.97fps. Other than that, 1080p content seems non-existent at the moment. It is always possible that some of the content offerings I did not explore do offer 1080p content. As a final note regarding usage, I did experience two instances where the XD|S was in an unresponsive state displaying a green screen and required a power cycle which meant physically unplugging the device and plugging it back in. Note: Just before publishing this article, Roku has updated its web site to indicate that USB file support is not officially available until January 2011. Previously, the promise date was listed as December 2010. It seems a bit odd that one of the differentiating features of the Roku XD|S, file playback via USB 2.0 port, is currently a “private” channel that is apparently developed by a third-party developer. Clicking on the channel produces a folder navigation interface. Local media playback via the USB 2.0 port is extremely limited compared to other devices on the market (see specifications table for file types that are listed as supported). I was successful in playing back 1080p (both 23.976fps and 29.97fps) mp4 and m4v H.264 media with either a Dolby Digital audio track or an AAC audio track. The Dolby Digital track was bitstreamed via both HDMI and the optical digital audio port. One important item to note is that while the media was decoded, it was merely output at 720p and not the source resolution of 1080p (this was true of files encoded at 23.976fps and 29.97fps). I was successful in playing back MPEG-1 Layer-3 (mp3) and MPEG4 Audio (m4a) AAC-LC audio files, however, I was not successful in playing back ADTS AAC-LC (aac) files. Both JPG and PNG image formats displayed without issue. The Roku XD|S measured around 7 watts whether idle or playing back content. When using the wireless connection, the power draw increased approximately 1 watt. When plugging in USB flash memory, the power draw increased approximately 0.5 watts. The Roku XD|S is a mixed bag. The hardware platform and price point are reasonable for what the XD|S strives to be, that is an easy to use Internet streaming platform that is continually improving with a growing content library, local media support, and ability to fit into any A/V environment. Unfortunately, the device doesn’t seem quite ready to succeed in its current state. The stability and setup issues I experienced do not inspire me to give the device to someone less technologically inclined. I can’t recommend the device to anyone wanting Hulu Plus in HD or 1080p playback of local media files. The time spent buffering content makes it more frustrating if you just want to quickly browse through a few videos though it’s not too bad of an issue when engaging in playback of longer-form content. The fact that the USB file browser channel is “private” shows how the platform is still immature and not ready as advertised for the masses. To be fair, not all of these issues may be Roku’s, but they are at the mercy of their partners and must insure that the platform is fleshed out more thoroughly before expecting a mass audience to be satisfied. On the positive side, the Roku platform does have a lot more content available than my Samsung display or Blu-ray player and costs less than $100. It is extremely simple and intuitive to use for the most part and operates with very little power. The form factor and A/V connectivity will allow the XD|S to fit into most any configuration. The platform always has potential for improvement in both content offerings and firmware updates. Thanks to Roku for providing us a review sample. The Roku XD|S can be purchased from Amazon.com. Notes: The component video output was not tested and requires a special cable that must be purchased separately. Dual-band wireless functionality was not tested.